This line chart was made with AChartEngine for Android. If you want to make charts and graphs for your Android app you should have a look at AChartEngine. The library supports many types of graphs including bar graphs, line charts and multiple series charts. 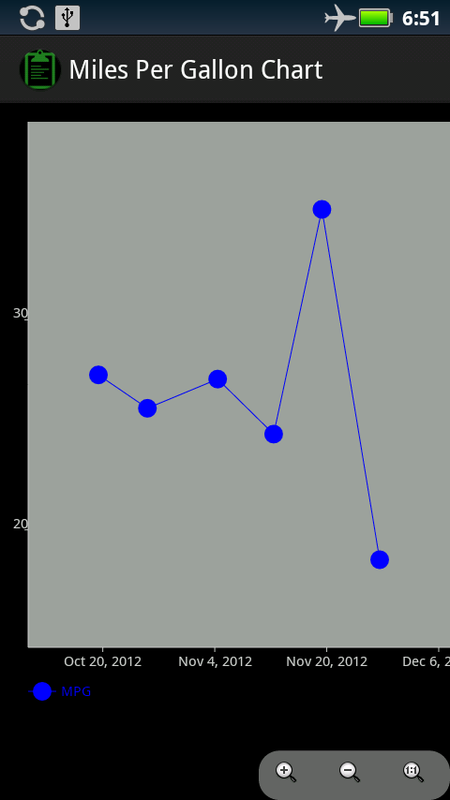 I have recently integrated the charting library AChartEngine for Android. I am using it to make line graphs of gas mileage. The gas mileage is charted against the date. AChartEngine is released under Apache 2.0. The library doesn’t have the greatest documentation, but it does come with an extensive sample application and javadocs. This Stack Overflow post shows more choices of charting libraries for Android.